This is the brilliant project my friend Julie was working on one day. She called me up because she needed a second command central binder … and she needed it now! Here’s how she put her command central binder to work in a new and fun way! Fill the pockets with un-tested recipes you collect from friends, family or magazines. Fill the other pockets with coupons for grocery items and menu planning / shopping list templates. Feel free to use my grocery list. 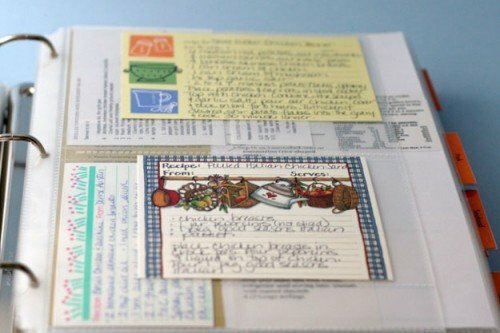 Use the magazine inserts for cooking magazines or small cookbooks. 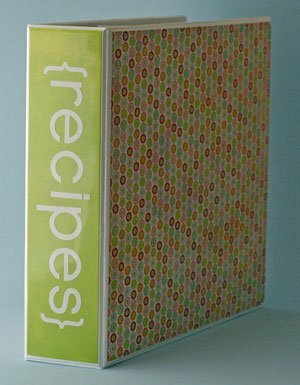 Slip your favorite clipped recipes inside the included clear plastic sheet protectors. This will keep your recipes protected from splashes and spills, plus keep them right at your finger tips for easy menu planning and grocery list making! I use a “tried and true” recipe command central binder and it saves oodles of time preparing my shopping list and planning meals. Give it a try and let me know what you think!